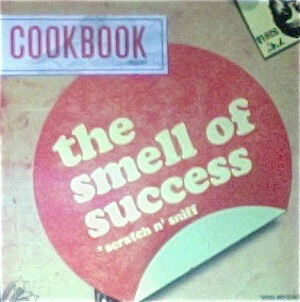 RapReviews.com Feature for June 19, 2012 - Cookbook's "The Smell of Success"
Beat you with a bat 'til I shatter them Dre headphones!" "Chino the lyric Jesus" definitely lives up to Cook's vow that he wanted to be bodied on his own song - in fact Chino bodies it so hard he may have bumped into Uno Mas on the following track "D.I.Y. (My Way)" by accident. Styliztik Jones and El Prez join Uno Mas on the very next cut - the album's first official single "The Party's Still Jumpin'." Thankfully this is one you CAN hear - peep the official video below. Back to the guest list for "The Smell of Success" party though, and it's a dope selection on this 14 track album. Eligh creates a "Wonderful Taste" when he gets to add his flavors, but Open Mike Eagle's got some "Original Ideas" for his track, and Guilty Simpson does his thing on the album's title song too. What's surprising about Cook's album, which the one sheet describes as "his realest to date," is just how much of the spotlight the otherwise modest man is willing to take. I genuinely regret having to criticize it a bit - I like what Cook stands for as an artist and as a musician - but songs like "Uncle Cookie" do serve as a reminder that rapping isn't really his forte. He's trying really hard on this one, flowing very sternly and precisely, but that leads to a forced and somewhat monotone delivery that's just not natural for an emcee. And at night I lie on fine linens"
It's hard to convey just how maticulously he spits every syllable here. Calling it "robotic" does the man a disservice, and yet if you imagined how somebody speaks when they pretend to be a robot, it's really not that far off (sorry Cook). Happily most of the flavor you want to savor is in the production, and there's tons of soul in the stew. From the electric up-tempo funk of "Get That!!!" to the laid back and funny melodic "WhatIGottaDo?!?" to the heartfelt "Anthem for the Damaged" with an EXCELLENT sample of Gerald McMann's "Cry Little Sister" (I hope that didn't blow the whole budget), there's plenty of material to leave you pleasantly full. He may not be the greatest emcee ever, but you can't fault his modesty or sincerity about it too much, and as the production and guests more than make up for it "The Smell of Success" should be on your summer purchase list.